Ionic Cleanse removes toxin from your body on a cellular level. The feet have the most pores in our body which allows for toxins to enter into our body through our skin. 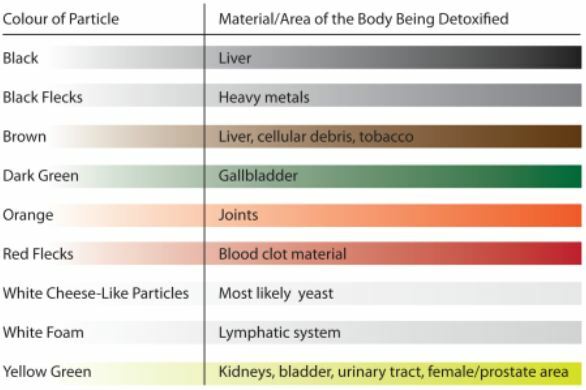 It takes only 26 seconds from point of contact for toxins to enter our body. Environmental toxins that enter our body through our nasal passages as well as the air we breathe. Results depend upon your lifestyle, as in smoker, construction worker etc. HOW IT MAKES YOU DETOX? The machine does not make your body detox. It helps to stimulate your own system to enable self-detoxification and re-balance your body, as shown in research using the medically approved equipment. This therapy is as relaxing as it is beneficial. The session treatment includes a 15 min calf and foot massage. 30 minute soak in a carefully controlled foot bath solution. Note: There may be Lymphatic Fat or Mucus floating on the water- no need for alarm this is normal. Persons with type 1 Diabetes / feet with open wounds.